The use of non-contact measurement methods for detecting and locating sources of nonlinearities can be potentially a break-through in the nowadays experimental modal analysis. The primary goal is to define more effective test strategies, whereby contact sensors will measure the nonlinear vibration responses at the best location possible. Jointed structures are a typical example where a large number of the joint can pose the question of where what and how to measure the nonlinear response. Upon the identification of one, or more, nonlinear response mode the objective is to determine where is the source of such nonlinear vibration. Nonlinearity can be characterised when its source is well defined and can be adequately tested. 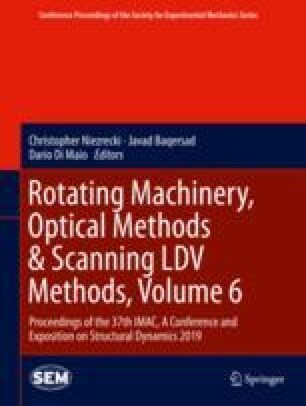 This paper will attempt to detect and locate the source of nonlinearity from a multi-beam jointed assembly. The approach will be carried out by using both contact and non-contact measurement methods, the results of which will be compared and evaluated. The operator to detect the source of nonlinearity will be the coherence function applied to random response data.